A primary interest of mine is supporting students development, & an important aspect of this is facilitating communication. @Stanmore college we have implemented what could be called an online “Personalised Learning Environment” (PLE) . This YouTube screen-cast should give you some insight. However in my experience it would do no harm if all maintained schools provided certain things as standard to staff & parents online. In a recent book called “14-18 a new vision for secondary education” by Kenneth Baker (a former secretary of state for education), Mike Tomlinson and others makes a number of recommendations. The fundamental recommendations being establishing more middle schools for 9-13yrs, and improving the options we offer 14-18 year olds and their families. 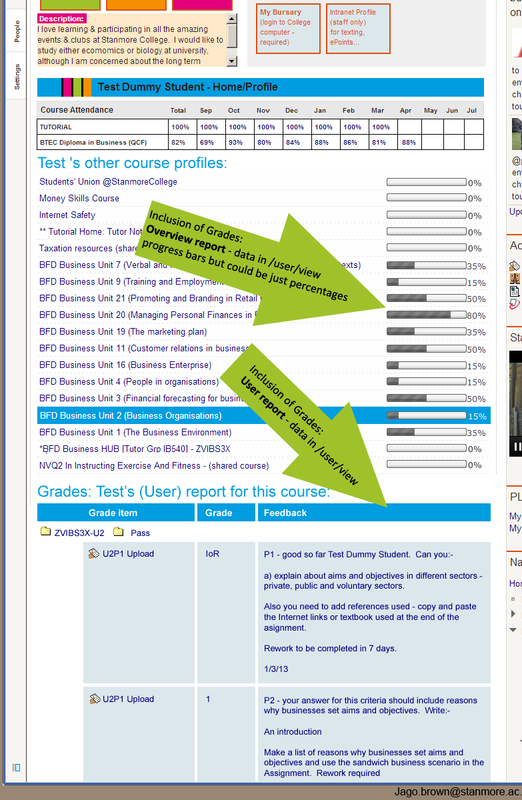 Having implemented the changes shown in the previous blog post, adding Grades & Feedback seem like a logical improvement ? @stanmoreCollege we are looking at ways to improve, customise & better integrate the pages which present information about a particular student. 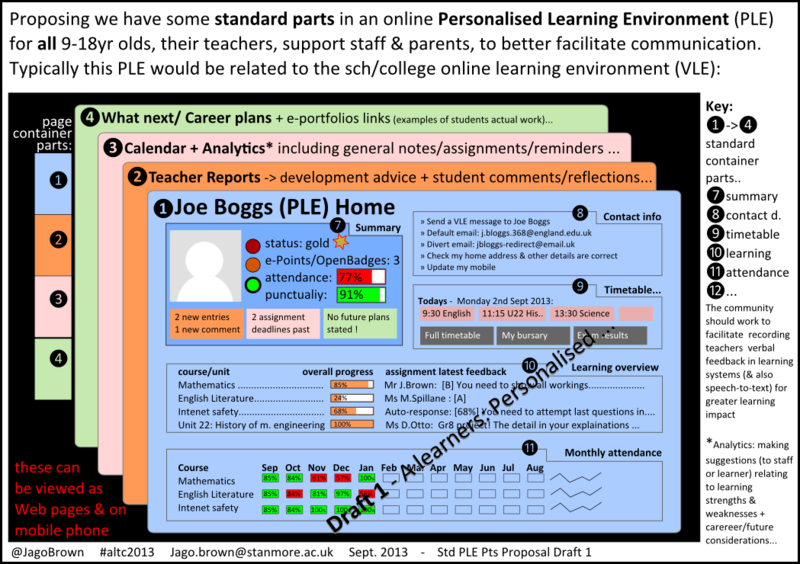 For example the “My Moodle Page”, the Grades “User report” page, ILP Block & other custom pages…Over time I hope to post examples of our other personalised pages for the interest to others. @StanmoreCollege started to use Moodle (1.7) in 2007 and it is now used by nearly every member of staff & full time student in some capacity. The broad aim was to prepare the site for another 5 years of intensive communication, learning & creative use. By creative, I mean I wanted the database, codebase & servers setup so the college could readily exploit new services & software that could enhance teaching & learning. For example integrating with other community resources (personal blogs, mnet, hubs…) & publishing to the community. Ideally we would have installed a fresh moodle 2 site & built the 300+ courses from scratch, but this would loose the user account #IDs which links to users (ILP 1.0) Personal Learning Plan data in moodle 1.9 (PLP) & could require returning students to update their profile… This would also take hundreds of hours of teachers time to rebuild the courses, so the compromise was to upgrade the existing moodle 1.9 site to 2.2, then migrate the required courses across to a fresh moodle 2.2 installation (backup & restore), but where certain data* for example the Moodle 1.9 mdl_user table… was migrated to the fresh 2.2 installation. Turnitin Assignment type –> Deleted all instances of this prior to migration due to issues! Thousands of the mdl_user rows from the upgraded table were inserted into this fresh installation. This was necessary because I wanted all returning students to be able to login without requiring them to update their moodle profiles. Also for their ILP 1.0 data to be available. This resulted in reducing the DB & moodledata by well over half, which is good as Media & Computer teachers are now needing students to be able to upload files upto 50MB.